Tomatoes are the number one item grown in the home vegetable garden. And while many people will still and always refer to the tomato as a vegetable the tomato is botanically a fruit. 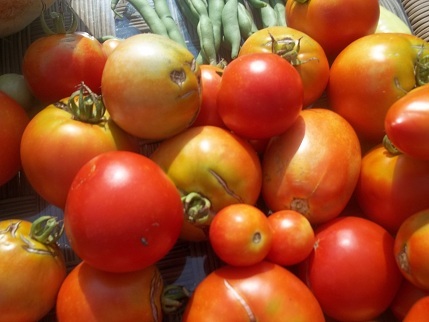 Tomatoes are also one of the easiest fruits to grow in the home vegetable garden. With the wide range of tomato varieties to choose from, you are sure to find the right tomato plant for your specific climate. How you specifically use your tomato for consumption may also steer you into the direction of which tomato variety you will grow. For instance, I find using home grown Roma tomatoes are the most ideal to make tomato based sauces and tomato based salsas. The main reason being, besides the great taste Roma tomatoes have, is the fact that it is easier to remove the seeds from Roma tomatoes. Now that is not to say that other varieties of tomatoes such as cherry, pear or beefsteak tomatoes would not serve the same purpose for a recipe. From my own experience, removing tomato seeds can be time consuming in varieties not named Roma. I will save the beefsteak tomatoes for my summer lunchtime sandwich with mayo and cherry tomatoes for salads. Regardless of which tomato variety you choose, I believe that you will not find anything more rewarding in your garden, especially for your tomato crop, than growing all of those tasty tomatoes from seeds. Something about the challenge of growing tomatoes directly from the seed, starting your tomato plants indoors before you can even move the tomato plants to the outdoors, strikes me (and maybe you) as one of those tasks where you say, “Yeah, I did it, I grew those tomatoes from seeds”. Here is what I do, to maximize the success of my tomato plants, and of course yield nice juicy tomatoes for all of those tomato recipe items I mentioned earlier. As with other seeds, you won’t have much luck in the germination process with your tomato seeds if you start with a terrible starter soil. Here is where you have plenty of options to start your tomato seeds in. You have the expandable peat pellets. These are small hard and compressed starter pellets that you add hot water to and they expand. I use these quite often to start my tomato seeds and do very well with them. Using the peat pellets, I easily get about 95% to 97% germination rates of my tomato seeds. Of course I also use them in conjunction with a propagation dome. Along with peat pellets, you can start your tomato seeds in a pre-packaged starter soil that you can purchase at any home or garden center. These starter soils are especially formulated for seed starting. They now even make starter soils for tomato seeds. Tomato seed starting soil includes specific nutrients that not only increase germination rates, but help build strong roots of the young tomato plants, when the tomato plants need it the most. You can also make your own tomato seed starting soil with many recipes found by doing a quick Google search. Tomato seed starting soil recipes are plenty in abundance online. You are sure to find a tomato seed starting soil that meets your climate and zone requirements. Under optimal growing conditions, and that means, your tomato seed starters are getting at least 6 hours of sunlight per day, are in a propagation dome (or something similar), and the soil is moist but not saturated, you can expect your tomato seeds to germinate in as little as 6 days. If you do not see any activity out of your tomato seeds after day 10, something has gone wrong, and you may have to start over. Tomatoes love to grow in climates that are hot and humid, which explains why we here in New Jersey do so well with growing tomatoes. Even in the worse of years with drought, our tomatoes in New Jersey seem to produce above average. With that said, do not transplant your tomato starters too soon. If the threat of frost is still at a medium to high level in your area, keep your tomato seed starters indoors until fear of frost passes by. A single night’s worth of frost will decimate your tomato seed starters. You can always cover them at night with a cloche or a 6 mil thick clear plastic tarp, but I like to leave my tomato seed starters indoors until the time comes to move them. I won’t get into too much detail regarding hardening off your tomato plants in this article and podcast series. As a quick overview, hardening off your tomato plants simply means to get them used to the outdoors so as not to shock your tomato plants when you do make the move. When planting your tomato starters outdoors, choose a location that receives a full day’s worth of sun and try not to plant your tomato plants in an area where you previously planted potatoes, peppers or eggplants. When it comes to spacing out your tomato plants, I have read a thousand different sizes that will work for hundreds of different tomato varieties. For me, I like to prop up my tomato plants with tomato cages. They cost a couple of bucks a piece from the local home center and are virtually maintenance free. Getting back to tomato spacing, I use the measurement of the diameter of the tomato cage top and add 6 inches. It is this measurement that I use to space out my tomato plants. This method has worked out well for me for the better part of 30 years. Some people like to use tomato stakes and other methods to support their tomato plants and all I am sure they are all fine. In fact my dad used me and my brother’s old hockey sticks when we were kids to use as stakes for his tomato plants. You are only limited by your imagination. However, when in doubt, space out your tomato plants no less than fifteen inches, and even at that spacing, that will be tight. As a side note, yes those Topsy Turvey™ upside down tomato planters really do work and produce a lot of tomatoes. So if you are limited on space, it may be a good way for you to go. You can also make your own upside down tomato growers out of some 5 gallon buckets, but I will save that for a future discussion. Now that you have your tomatoes started, transplanted and supported, let’s talk about simple care. While your tomato plants are growing give them a good watering making sure the soil your tomatoes are planted in remains moist but not saturated. Once you begin to harvest your tomatoes you can reduce your watering, unless of course conditions are very dry. Tomatoes required high amounts of nutrients, especially Nitrogen, Potassium and Phosphorous. Be sure to add these as the season goes on. Again there are plenty of choices for your tomato plants, from organic, to Miracle Gro™ and tomato specific formulas. Me personally, I create loads of compost and will continually add this to the base of my tomato plants throughout the course of my gardening season. Good luck with your tomato crop for many seasons to come! There are a number of manufacturers and suppliers of Vegetable Seeds. Farms that sell vegetable seeds in large quantities to vegetable seed distributors to smaller clearing house vegetable seed providers that you can find selling quantities of vegetable seeds more suitable for a small to medium sized vegetable gardens such as those selling vegetable seeds on eBay and the like. As a disclaimer, I too operate a company that sells vegetable seeds. Specifically we sell those vegetable seeds to home vegetable gardeners. We buy our vegetable seeds in very large quantities, from farms that, obviously, sell vegetable seeds in bulk. We do so to keep the costs of those vegetable seeds at the lowest possible price and in turn we pass those savings onto our customers. 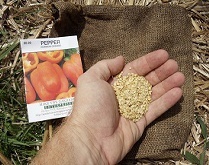 I would imagine that other vegetable seed companies, who cater to the same home vegetable gardening audience, do the same when procuring their quantities and varieties of vegetable seeds. But specific vegetable seed companies are not what I wanted to talk about in today’s article on vegetable seeds (or for those that are listening to this transcript via our vegetable seeds podcast). I wanted to address a great issue on vegetable seeds that I receive questions for from our followers on our Facebook page, where we discuss vegetables seeds and vegetable gardening all the time. For me personally, I like to store my vegetable seeds in a cool dry location. That would translate into putting my vegetable seeds in a plastic container, such as a tupperware or rubbermaid bowl. A resealable ziploc bag works great as well for storing vegetable seeds. I make sure, that whichever packaging I use to hold the vegetable seeds, they are sealed tight. The vegetable seeds, will then go in a cabinet that I have in my basement, specifically for the purpose of vegetable seed storage. Well, ok, the vegetable seeds do share space with some of the kids’ toys. But that is a whole other topic. The temperature in my basement is fairly constant throughout the year, which is a perfect storage environment for my vegetable seeds. I have vegetable seeds that are over 5 years old and am still getting great germination success rates on them. For example, the rule of thumb on many variety of onion vegetable seeds is two years and then the germination rate begins to decline. This past season I grew some onions directly from seeds, sewn into a four foot by four foot raised bed and did well with them. These particular vegetable seeds were 6 years old! I had about an 85% germination rate of these particular vegetable seeds. Let’s say you do not have a basement to store your vegetable seeds. What do you do then? That is exactly what I will talk about in Part 2 of Storing Your Vegetable Seeds. Some of our Facebook followers came up with some great and unique ways to preserve their vegetable seeds. ﻿In a recent article in the Wall Street Journal researchers showed that men who consumed high levels of the antioxidant, Lycopene, reduced the chance of a stroke by 55%. The study conducted in Finland, included 1,031 particpants, all male, ranging in ages of 42 to 61. Lycopene is an antioxidant found primarily in tomatoes but can also be found in watermelon, grapefruit, papaya and mango. According to the USDA, tomatoes are the number one plant grown in the home vegetable garden in the United States by more than 5 to 1 of it's next closest competitor, the pepper or cucumber, depending on which survey you read. That translates into a lot of people "growing" their own lycopene right at home. "Lycopene is a carotenoid compound that accounts for the red color in tomatoes. It is the most abundant form of carotenoids (of a total of 600) in the US diet," says Dr. Lori Shemek the health expert for ABC's Good Morning Texas. "The bioavailability of lycopene is increased following cooking. And so cooked tomato products have higher levels of lycopene than raw. - This is because the cooking process breaks down the cell walls of the tomato which makes the lycopene more available"
According to Dr. Shemek, who also authored the book Fire up your Fat Burn, she says lycopene is so powerful because it has been shown to protect against degenerative diseases by neutralizing free radicals in a person's body. "Lycopene may help prevent DNA damage in the cells and help the cells to function better," continues Dr. Shemek. "High levels of lycopene, in the blood and fatty tissues, correlate with reduced risk of cancers, heart disease and macular degeneration. The human body cannot produce lycopene so it must be obtained from food sources." While no studies currently exist showing if lycopene levels are higher or lower in home grown tomatoes compared to store bought ones, no one can disagree with how easy they are to grow at home, and taste much better. When I asked Dr. Shemek how much lycopene one can expect to get from a tomato, she said that one fresh tomato accounts for about 4mg, where as a cooked tomato can be as high as 25mg. Leading to a fact that such items as tomato soup and sauces will yield higher levels of this powerful antioxidant. Because lycopene is a cartenoid and phytonutrient found in red fruits there are other options than tomatoes. Along with the four mentioned earlier, you will find lycopene in various quantities in guavas, red cabbage, and chili peppers. Just think red, think fresh and you are sure to get a good supply of this healthy fighter.